The pro-life movement has been blessed to have many great founding leaders who worked in support of personhood for every innocent human being from his beginning. These heroes dedicated their lives and careers to preserving the lives of preborn babies and to educating the public on the horrors of the many threats against them. One such heroine was Dr. Mildred Fay Jefferson—a petite African-American doctor with a powerful message of respect for all human beings from creation until death. Lecture (20 minutes): Read Speaking out on behalf of preborn children aloud to the students. Discussion (15 minutes): Engage the students in a discussion using the discussion questions provided. Discover each person’s special role in building a culture of life. Learn how to use our God-given talents in the service of the culture of life. Dr. Mildred Fay Jefferson was born in Texas in 1926 at a time of intense racism and prejudice against the African-American population. Exceptionally intelligent, Dr. Jefferson graduated high school at the age of 15 and college at the age of 18. She earned a master’s degree in biology before moving on to become the first black woman to graduate, in 1951, from Harvard Medical School. She then became the first woman to intern at Boston City Hospital, the first female surgeon at the Boston University Medical Center, and the first woman elected to membership of the Boston Surgical Society. But Dr. Jefferson didn’t stop there. Her determination and her concern for others led her to the pro-life movement. Driven by her heartfelt patriotism and strong faith in God, Dr. Jefferson worked to protect babies from abortion. Helping found the National Right to Life Committee in the early 1970s, Dr. Jefferson was a leading spokesperson of the pro-life movement for many years, mentoring and influencing other pro-life leaders such as Judie Brown, cofounder of American Life League. Dr. Jefferson believed that pro-lifers have a duty to engage in the political processes of our great nation in order to give a voice to preborn children who can’t vote or speak for themselves. She said: “I am at once a physician, a citizen, and a woman, and I am not willing to stand aside and allow this concept of expendable human lives to turn this great land of ours into just another exclusive reservation where only the perfect, the privileged, and the planned have the right to live.” Dr. Jefferson understood that if she didn’t speak up, no one else would take her place. She could have kept her pro-life beliefs to herself, so as not to call attention to herself or upset her colleagues, but she knew she could never stay silent. She felt it was her duty to give voice to preborn children, no matter the personal cost to herself. As a gifted orator, Dr. Jefferson traveled throughout the country to speak in front of thousands of people. She testified several times before Congress, using her medical expertise in defense of the preborn child. “I became a physician in order to help save lives, not to destroy them,” she said. Her logical defense of the preborn child’s right to life on the television program The Advocates in 1972 influenced then-President Ronald Reagan’s views on abortion and helped him to become one of the staunchest supporters of the pro-life movement in the White House. I hope you won’t mind my writing to you, but I had to tell you how truly great you were in your testimony on The Advocates program regarding abortion. Yours was the most clear-cut exposition on this problem that I have ever heard. . . . Several years ago I was faced with the issue of whether to sign a California abortion bill. . . . I must confess to never having given the matter of abortion any serious thought until that time. No other issue since I have been in office has caused me to do so much study and soul-searching. . . . I wish I could have heard your views before our legislation was passed. You made it irrefutably clear than an abortion is the taking of a human life. I’m grateful to you. During the 1970s, Dr. Jefferson was the national media’s most popular pro-life advocate, appearing on dozens of national television programs and being quoted or featured in countless major newspapers in the United States. Because of her courage to speak up and use her talents to protect the most vulnerable people in society, Dr. Jefferson was able to change hearts and minds in ways that she could never have imagined. In an age where babies are murdered because of the color of their skin or because they are female, Dr. Mildred Jefferson remains an inspiration because of her tenacity and tireless service in the pro-life movement. Her life is an example to all pro-life people that, no matter what obstacles society puts in our way, we have the duty to protect all human beings from creation until death and to create a culture of life. To some, public speaking comes naturally, but most people find speaking in front of a crowd difficult, not to mention nerve-racking. Dr. Jefferson did not let her petite stature or pressure from her opponents keep her from speaking the truth. You won’t become an accomplished speaker overnight. Some people have more than just clumsiness to overcome—like speech impediments or shyness. But even the smallest voice can make a difference and help save the lives of countless preborn children. Practice speaking about your beliefs regularly, even if it just means telling your friends the truth about abortion. Educate yourself on current issues so that you’re ready to answer the tough questions with clarity and courage. Volunteer in your community; let your actions confirm your belief in the beauty and dignity of every human person. Pray for an end to threats against human beings, particularly abortion and euthanasia. You might not find yourself in a difficult situation every day, but you can start preparing yourself to be an advocate for human rights like Dr. Jefferson. Remember that it is our duty as members of the human family to stand up against injustice and to fight for the right to life of every human person. As with any pro-life hero, we should be so inspired by the person’s story of courage that we want to live in his footsteps. Ask yourself, How can I follow in the footsteps of Dr. Jefferson? What kinds of difficulties did Dr. Jefferson have to overcome in order to be an advocate for preborn children? Dr. Jefferson was born during a time of intense racism and sexism. Racial segregation and prejudice against the African-American community made it difficult for people like Dr. Jefferson to obtain a good education or higher paying jobs. Despite the prejudices of society, Dr. Jefferson achieved many great things in her lifetime. 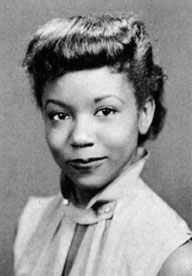 Not only did she complete high school at the age of 15, she was the first black woman to graduate from Harvard Medical School. As Dr. Jefferson became famous, how did she use her fame? Dr. Jefferson could have used her fame and notoriety to make a name for herself, but instead she chose to use her talents to work in the “politically incorrect” pro-life movement. Dr. Jefferson saw her work as more than just a job. She was saving lives and rebuilding society. How did Dr. Jefferson’s work help change society? Dr. Jefferson’s efforts yielded a change of heart in President Ronald Reagan, who later became the most pro-life president our country had ever known. Without Dr. Jefferson standing up in defense of preborn children, we wouldn’t have had such a strong pro-life advocate in President Reagan. Dr. Jefferson was only one person, but she was able impact hundreds, thousands, maybe even millions of people. What is our duty as pro-lifers? Even if public speaking is not one of our gifts, we know that we have a sacred duty to protect other people—particularly people in our society who are bullied or marginalized. To do nothing—to stay silent or inactive—is to acquiesce to the pro-abortion side. If you truly believe in the right to life of every human person, you must do something about it. The lives of countless people are counting on you to make a difference. What do you think would happen if we were all as courageous and outspoken as Dr. Jefferson? If every pro-lifer were as convicted about the sanctity of human beings as Dr. Jefferson was, we could end abortion. Nothing great was ever achieved by ignoring a problem or refusing to stand up for other people. Like Dr. Jefferson, we have to concern ourselves with trying to save lives and rebuild our society to respect every human person. Imagine that you have one minute in front of a television audience to explain why preborn children are worth defending. What would you say? How would you declare your protection of preborn children? Younger students can make a picture collage of Dr. Jefferson and her accomplishments using magazine clippings, clip art, hand drawings, and other images to represent her achievements (a diploma to represent her degree from Harvard, a pro-life sign to represent her pro-life work, etc.). Display finished projects on a class bulletin board.